One of the weaker engineering features of the Lotus Elise are the headlight and turn signal assembly mounts. Both are overly dependent on inadequate plastic structures, and consequently will likely break the next time you remove them. 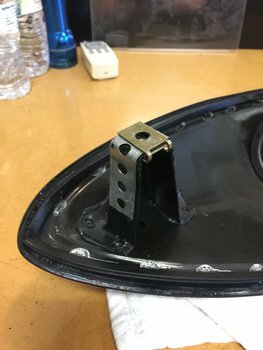 New OEM headlight assemblies cost about $900, so if your mount broke you have plenty of motivation to pursue a DIY fix. 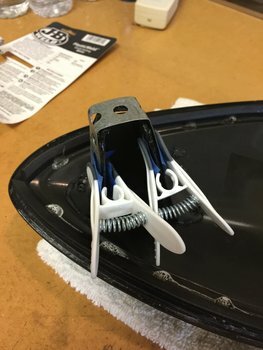 This article will illustrate a simple solution for broken headlight mounts that worked for me. Optional: Replacement automotive Speed Nuts (size M6). 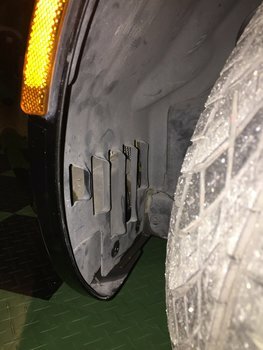 Note: My bolts were hanging up in the original speed nuts, getting tight to turn before they were even screwed all the way down. So I purchased new Dorman brand replacements, which I later discovered have the tension tab on the top surface. The original speed nuts have a tension tab on the underside, letting them sit flush to the mounting area. Consequently I decided to re-use the original speed nuts, after tapping them using a tap-and-die set to keep the bolt from hanging up. 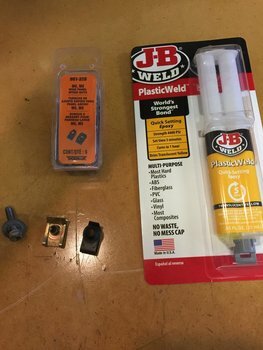 These items are available from numerous home improvement and auto repair stores. Park the car on a flat area and secure the parking brake. Turn the front wheels all the way to the left/right (depending on which side your repairing) to gain working access to the fore tire well panel. 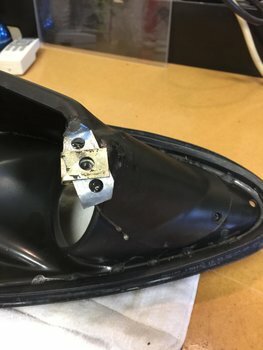 The plastic tire well panel is secured by 3 screws. The bottom 2 have plastic anchor inserts, while the top screw has a flat metal retaining washer. With the 3 screws and 2 anchors removed, pull the plastic panel with a simultaneous down and away motion to free it from its mounting area. The headlight assembly is secured to the car with 3 Allen bolts, each with a metal retaining washer. These may be removed using the Allen wrench from your Lotus tool kit, or a similar wrench. 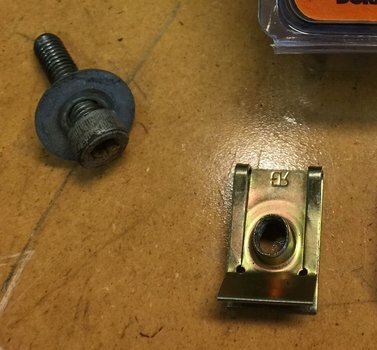 These bolts are (were) secured to the plastic headlight mount assemblies with speed nuts. We'll be repairing the broken plastic structure that supports the speed nut. We're going to use the Plumbers Strapping Tape to fabricate a new mounting surface for the headlight. These may take different shapes, depending on which mount(s) are broken. In this example, I fabricated 2 mounting fixtures, one for the bottom tower and another for the top mount (the middle mount was still intact). 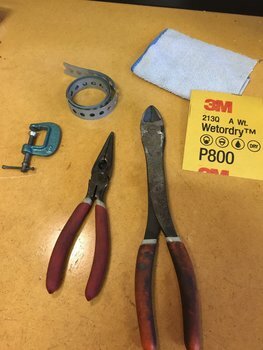 I cut the stap to length using tin snips, then shaped them to fit using the pliers. To avoid scratchin the clear surface of the headlight, place a clean shop towel down underneath. Also try very hard not to get any sticky-with-adhesive fingers on the headlight cover! 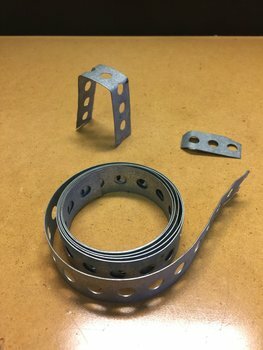 Using a Rat Tail or similar tool, ream the mounting hole on the strapping tape to slot the opening. This will provide some alignment 'slop' and allow the speed nuts to move into place for easier mounting. Try not to leave any sharp exposed edges from the cut strapping tape. Either cut them back or use electrical tape on exposed edges. Your hands will thank you next time your working in this area. Test-fit the new mounting straps. Once your satisfied with them, prep the plastic mounting areas for adhesive by sanding them to a rough surface, then wipe the sanded area clean. Mix a dab of the epoxy and apply to all mounting surfaces (both the metal strap and the plastic mounting area). 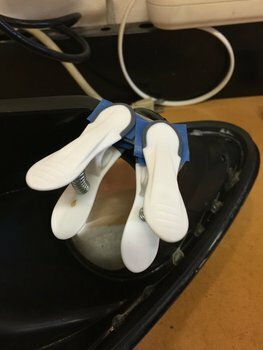 Assemble the new strapping mounts in place and attach the clamps to secure them for a tight bond. Let the adhesive bond for the recommended time period (I left them overnight). Once they're secure, mount the headlight assembly using the 3 Allen bolts. 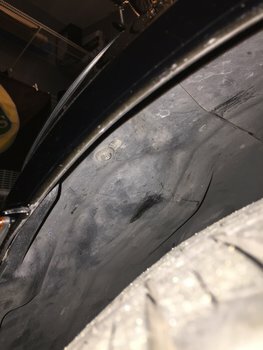 Replace and secure the tire well access panel with the 3 screws (Note: the metal tab at the top of the panel slips under the existing plastic tire well. I was able to slip it under their using a diagonal approach to the opening with the top of the panel).